Home / Abusive Enforcer / Chester Obligacion / Paranaque City / Paranaque TMO / Traffic Enforcer / Viral Videos / Must Watch: Abusive Traffic Enforcer in Paranaque Caught on Camera "Burahin mo yan baka hindi mo ako kilala!" Must Watch: Abusive Traffic Enforcer in Paranaque Caught on Camera "Burahin mo yan baka hindi mo ako kilala!" 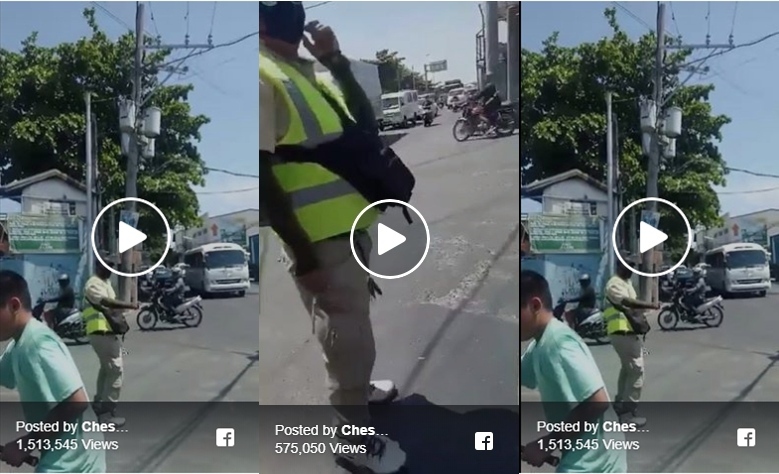 A traffic enforcer from Paranaque City is now making the rounds on social media after he was caught on camera threatening a rider during a traffic violation apprehension. Concerned citizen Chester Obligacion took to Facebook and shared a video of the incident involving an alleged abusive traffic enforcer, as he mentioned also that there are reports of abuses committed by the head of the Traffic Management Office in Paranaque City, that could be reasons why his men were also abusive. Obligacion is calling the attention of Paranaque Mayor Edwin Olivarez to investigate the case involving one of his traffic enforcers who was reportedly been doing the same things over and over again. As clearly seen in the video the traffic enforcer harassed the motorcycle rider who took video by getting the motorcycle keys from the rider. The unnamed traffic enforcer also threatened the kill the rider if he refused to delete the video taken during the incident. The video immediately generated some buzz in the online world as it garnered more than 2 million views within 24 hours after it was posted on social media. Various Facebook Page and Groups also posted a controversial video on social media. Mga abusadong traffic enforcer dito sa Paranaque city! Kinuha pa po yung susi nung motor nung hinuli niya! Wow! Tsk tsk tsk ganito ka abusado mga enforcers dito sa Paranaque city! Mayor Edwin Olivarez, matagal na tong problema nato na abusado mga traffic enforcers mo! Abusado ksi hepe ng TMO kaya mayabang din lahat yan! Ronaldo Dominguiano: Yabang.kala.mo.sino.yan ang walang sa trapiko.dapat dyan sa carbage collector nyo sir.ilagay.bagay siya dyan.bubo.yan sa ttaffic.mgt. Ed Ferrer: Mga kuya wag kayong masyadong maangas sa kalsada eh baka balikan kayo d nyo Alam Kung sino Ang titira sa into kaya konting problems pgusapan na lang,Wala nmang violation Ang hinuli mo tapos Todo mura ka at sabihan mo patayin Kita ngayon,yon pinatay mo d pa nga naililibing papatay ka na nman?matakot ka sa DIYOS,baka atakihin ka eh walang turulong sa iyo!!! Aladino Naldoza: tarantado nga. ano karapatan nang kunin ang susi ng motoresta. kng may pagkkamali ang motoresta ticketan mo taranado kang enforcer..